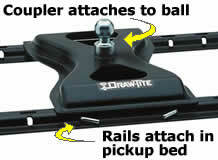 A Gooseneck Hitch is designed for use in a pickup truck similar to a Fifth Wheel. The difference is that the Gooseneck uses a ball and coupler instead of a kingpin and pin receiver. Typically, the trailers that are most commonly used for this type of Gooseneck Hitch is a horse trailer. Explain the difference between a Gooseneck & a Fifth Wheel? The Gooseneck Hitch utilizes a ball on the hitch that engages with a coupler on the trailer. That differs from the Fifth Wheel Hitch which has a King Pin on the trailer that engages with a King Pin Funnel on the Fifth Wheel Hitch. Gooseneck Hitches can be purchased as Under-Bed, Fold-Down or Above-Bed models that allow you to quickly remove the ball from the truck bed when not in use. One moment the hitch ball is ready for towing and the next moment it is out of the way leaving the bed free of obstructions. Above-Bed Gooseneck Hitches utilize the same set of rails as a Fifth Wheel Hitch making it easy to switch between these two different styles of hitches if you happen to have both a Gooseneck and a Fifth Wheel trailer. The Elite Series hitches have this ability.